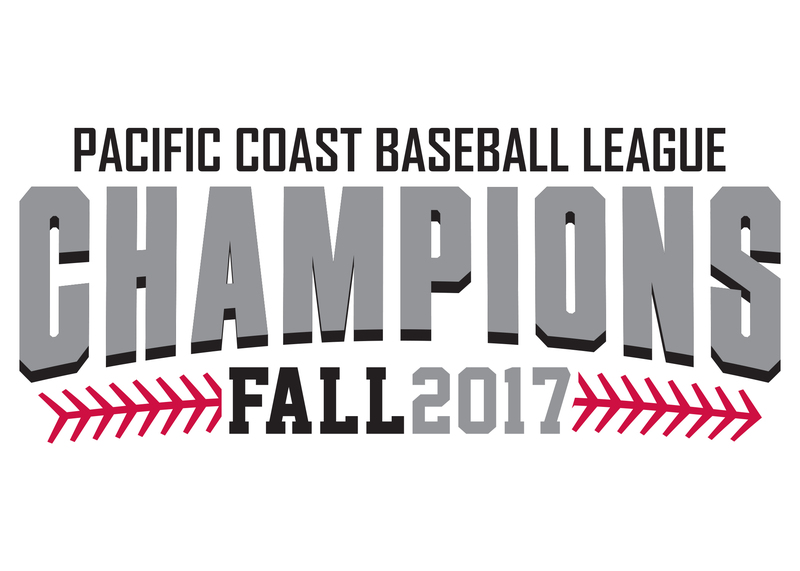 Another beautiful SoCal day greeted us as we welcomed a couple of newcomers to the 2017 AA Fall Championship Game! 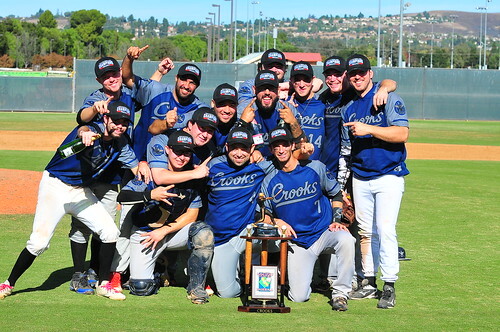 The Berserkers, who finished second in the regular season and had already beaten the 2015 and 2016 champion Royals in the first round and the 2014 champion Warriors in the second round, faced off with the Crooks, who took down the Hollywood Expos in the first round and the 2016 and 2017 runner-up Lookouts in the second round. These two teams both earned their spot in this game, and a big crowd showed up on both sides to cheer them on! The Berserkers wasted no time getting on the board in the first against the Crooks' Chris "Hosh" Hoshyarsar (the Fall 2017 AA Cy Young award winner.) George Williams and Nick Koontz led off with back-to-back singles, and Johnny Lopez walked to load the bases. After a strikeout, Mickey Anderson grounded out to plate one. Dan Hagman walked to load the bases again, but Hoshyarsar wiggled out of the jam. Michael "Mags" Maglione worked a quiet bottom of the first for the Berserkers, who led 1-0 after 1. Mags led off the top of the 2nd with a looper into left-center, but Crooks' shortstop Josh White made a Sportscenter-worthy diving catch to rob him of a hit. After a Brady Anderson single, Hosh induced a 6-4-3 double play - another stellar job on defense by the Crooks. Leading off the bottom of the 2nd, Cory Baxter walked, and Nick Tatone reached on an error. 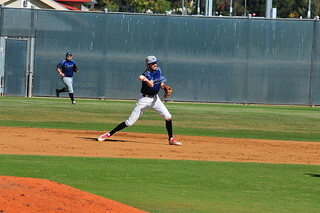 After a strikeout, Chris Hoshyarsar singled to load the bases. A wild pitch brought home Baxter, but Maglione escaped the jam, with the score now tied 1-1. Hoshyarsar worked around an Evan Johnson single in the 3rd, getting another double play, to keep the score tied, but it was the Berserkers defense time to shine in the bottom of the inning. After a David Pederson single, John Fox flew out to center. Berserkers centerfielder George Williams came up throwing, doubling Pederson off first. With the momentum back on their side, the Berserkers offense picked up in the 4th. Williams was hit by the first pitch he saw (or didn't see), and moved to second when Nick Koontz walked. 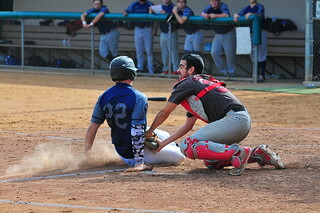 With 1 out, Marcos Rodriguez hit a ground ball to second, but an error loaded the bases. 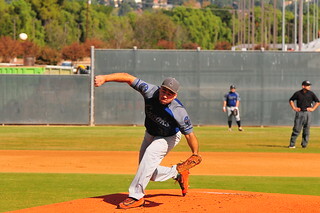 After a strikeout, Hoshyarsar looked ready to escape again, but Dan Hagman laced a doubled into right-center, plating 2 and giving the Berserkers a 3-1 lead. Heading into the bottom of the 5th, Maglione had only thrown 56 pitches. But the Crooks, who led the league in runs scored all year, was ready to erupt. Nick Tatone led off with a single. 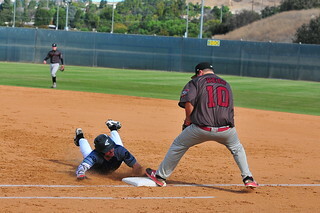 Jay Ayala was hit by a pitch, and Chris Hoshyarsar singled to load the bases. Tyler Panattoni singled home one. Joe Vega followed with what looked like a sacrifice fly, but upon appeal, the umpires called Ayala out at third for leaving early. That wouldn't slow down the Crooks offense, as David Pederson singled home the tying run, and John Fox followed up by singling home the go-ahead run. Jake White walked on a pitch in the dirt, but Pederson was caught being overly aggressive on the bases again, and thrown out after a short run-down. However, the Crooks plated 3 runs and led 4-3 after 5. Now with the lead, Hoshyarsar settled in, working around a few base runners (and inducing his 3rd double play of the day) to pitch a scoreless 6th and 7th inning. Meanwhile, the Berserkers went to their bullpen and brought in Nick Koontz. Koontz cruised through the next 3 innings (with the help of a web-gem by third baseman Dan Hagman) to keep the Crooks off the board the rest of the day. Heading into the 8th, the Crooks called on their bullpen and brought in Cory Baxter. Unfortunately for the Berserkers, Baxter was lights out, and worked the final 2 frames to bring home the Crooks' first championship! Congratulations to the Berserkers, who made their first Championship Game apperance since they joined the league in 2012. But the day (and the season) belonged to the Crooks - your 2017 AA Fall Champions! Congratulations to the 2017 AA-Division Champion Crooks!